Do you want to have an impressive garden during summer? Are you looking for a perfect tool that will help you when it comes to planting bulbs? Do not worry because I have some of the best bulb planters that will make your work easier. Planting bulbs can be a tough task and there are different ways in which you can do it. Some people prefer to use the trenching shovel to dig trenches but if you want to make your work less tedious, a bulb planter can be a great investment. There are different types of bulb planters that you can select. This ranges from manual models to ones with markings that help you measure the depth of the hole accurately. Other models are designed in a way that you get the chance to stand when you are working. We spent many hours researching and testing different bulb planters. Check out reviews and guide of our top recommendations and we hope it will be easy to make the right purchase decision. Before you buy a bulb planter, it would be wise if you check and compare our reviews first. Once you go through this list, you will find it easy to look for a product that meets your needs. Planting bulbs can be a tough job especially when you don't have the right tools to dig the planting holes. You will end up with sore joints and aching back.To prevent all these, get the ProPlugger 5-IN-1 Lawn Tool to help you make your work easier. This is a 5-in-1 tool so you can use it for a wide range of applications. It works as a tool for dust collection in the shed, lawn and sod plugger, a weeder, planting tool, soil sampler and a drip edge fertilizing tool. As compared to other tools, this one is durable so it will serve you for many years. It is made in the USA using welded carbon steel and has a powder coating to enhance its durability. using welded carbon steel and has a powder coating to enhance its durability. Working with this tool makes your work easier. It allows you to work in a standing position so you will not have to strain your back and knees. The bulb planter is designed with comfortable and sturdy hand grips that work well for people who have arthritis or seniors. It is easy to use because you just need to step, twist and then pull and you can now plant your bulbs. The soil is stored in the hole when you are working and you can empty it by turning the tool upside down. It has depth rings that allow you to dig consistent holes either 2 inch, 4 inch or 6 inch. Flower bulbs add a nice look to your landscape. If you are planning to plant bulbs either during summer or spring, having a bulb planter can be a great addition in your garden tools. The tool saves you the bending too much which can cause strain on your back and other body parts when you are planting. If you are wondering which bulb planter to buy, get the Edward Tools Bulb Planter and you will love planting bulbs. The planter is great for tulip bulb and you can also use it for daffodil bulbs, dahlia bulbs and lily bulbs. It comes with a lifetime warranty and in case it bends or breaks, you get a replacement. The bulb planter features an automatic soil release function that gives you a simple time when you are planting. You can complete your work in less time and little fatigue. I love this tool because it is designed to last for many years and provide you with a strong performance. It is designed with reinforced steel that ensures it doesn't bend when you are working. This makes it easier especially when you are digging through heavier soils. When you are planting bulbs, you want to get more consistent results. This is why this bulb planter has a depth marker that helps you achieve consistent depth results. When it comes to planting bulbs, there are different ways in which you can do it. There are those people who choose shovels but if you want to make your work easier, having a bulb planter makes the task faster and easier. The market is flooded with many products from different brands so it can be tough to choose the right one. However, Power Planter 3"x24" Extended Length Bulb & Bedding Plant Auger is from a reputable brand and works well to meet your bulb planting needs. One of the best things about power planter tools is that they are durable, affordable and efficient. This is exactly what you will get from this tool. The tool features quality craftsmanship so you can expect they will last for many years. Having this planter will help you plant bulbs, dig post holes, plant bare root trees or mix batches of mortar for landscape. The tool has a length of 24 inches that ensure it doesn't bend over when you are drilling. It is painted glossy black which gives it a nice appearance. If you need a bulb planter that will meet your landscaping and garden needs, I would recommend this tool. It is 100 percent made in the US so you have no worries about poor quality. Are you well prepared for the planting season? Do you have the right tools to make your work easier? If you want to make planting bulbs effortless, get the Jisco JB24 Bulb Planter. Any homeowner looking for a convenient garden splitter can depend on LEAF HD ZX-9 1 Garden Hose Splitter to meet your watering needs. It has an auger of 2.75 inch in diameter so it can hold potatoes and other larger bulbs. With this tool you can drill holes up to 24 inches deep. There are different ways in which you can use this bulb planter. Some of them include planting bedding plants, nursery stock seedlings and grass plugs. You can do the job pretty fast and effortless. This tool can fit cordless or corded drill measuring 3 inchx8 inch or 1 inch 2 inches. If you are planning to use it with a drill, it is important to take caution because the torque reaction can harm your hands. Because it is decently made, expect a very simple time when it comes to planting your bulbs. If you are approaching spring planting season, you can depend on this bulb planter. Even if you have the special garden hoe, planting bulbs can be a daunting task. You can simplify the task if you have a bulb planter. You might be asking yourself, do I really need a bulb planter? A bulb planter is a great companion for any gardener. It helps you plant bulbs easily and quickly so you do not have to bend or stoop which can make you feel exhausted. The main reason why I recommend this tool is because it is easy to use. You need to use it the same way you hold a shovel by gripping the handle and then ensure that your foot is on the footplate. After that, you just need to press the blade in the ground, twist and then remove. As you move from one bulb to the other, the core pops out itself. Sliding into the soil is easy because it is designed a sharp blade and a pointed tip. You don't need to do any assembly because it comes ready to use out of the box. When it comes to comfort, the tool features a T-bar grip that provides a great leverage to achieve maximum force while using little effort. It is also designed with non-slip foot place for safety purposes when you are working. Bulb planting is one of the most tiresome chores especially if you have to bend your back the whole time. Spare your back from strain by getting the Yard Butler Bulb and Garden Planter. Having this tool makes your work easier because you can plant bulbs faster and comfortably. It features a simple twisting action that makes it ideal for planting bulbs and bedding plants. The tool is designed with a long handle that prevents it from bending so you can easily plant your favorite bulbs while you are standing. You can drop seeds, plant or bulbs without bending your neck. If you want to get the best results when working with this tool, ensure that the soil is moist before you plant. Then position the tool where you want to plant the bulb, step down the side foot bar and then twist to get a hole. The next thing is to pull up and then tap to take away the core. You can use it to make perfect holes for different types of bulbs like tulips, dahlias, crocus, gladiolus, lilies or any spring flower. When it comes to durability, you are well covered. The planter features a durable powder coated steel that assures you of a longer life. You can enjoy a great performance from this tool for many years. One of the main reasons why people choose bulb planters is because of their efficiency. They help you avoid excessive bending so you can plant bulbs while you are standing. This is not only comfortable but it also saves you time and back strain. 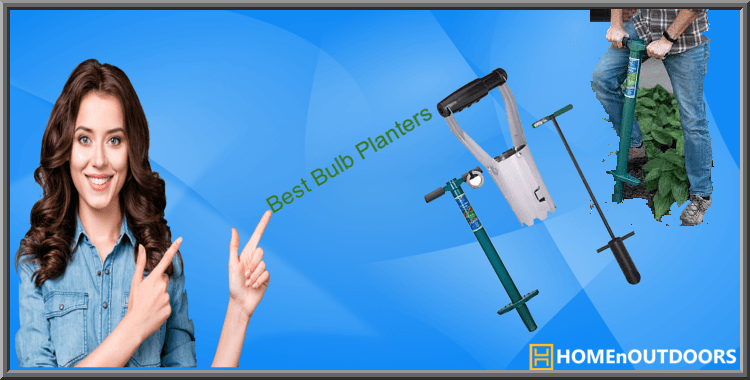 Wondering how you will pick the right bulb planter? Bond 9509 Plymouth Garden Bulb Planter is a quality tool that is trusted by many gardeners. This is a two-way hose connector that is well made and works well. It has a solid construction and doesn't leak even after frequent use. Spending your money on a quality tool will give you the needed performance for many years. This tool is designed with a durable hammer tone finish so that it can last for many years. In as much as the tool is made in China, you do not expect it to be low quality. The tool gets the work done but you need to use a little bit of your muscles. To enhance its longevity, it also has a powder coated finish. To offer you comfort when you are working, it has a wood handle so you will find it easy when you are doing your work. Having the right gardening tools make your work easier. Not only do they save you time but also strain on different body parts especially where bending is involved. If you want to make planting bulbs pretty easy, I would advise you to try the Bully Tools 92381 3/8-Inch Dibble Bar. This tool is designed to help you plant bulbs with ease. You can rely on this planter because it is from a reputable manufacturer well known for making farm and gardening tools. It is proudly made in the US making it a quality tool. It features a strong steel construction so you don't have to be worried about the durability. This is a dependable tool that is designed to last for many years while doing what it was made for. The bulb planter is designed with a t-style handle that is comfortable to hold. It also has an extra thick 3/8 inch blade that cut through soil with ease. One of the best things that I love about the tool is that it carries a lifetime warranty. It is well protected against any defects in regards to the material or craftsmanship. You can get this commercial grade tool for all your bulb planting requirements. Finding a perfect garden tool can be tough because there are so many models on the market today. They might all look the same but they vary in terms of features as well as performance. Make planting bulbs easier with the Esschert Design Dibber/Bulb Planter. This is a nice tool that any landscaper or gardener would love to have to make planting bulbs easier. As compared to other tools, this one is designed in a way that it can breach obstacles that are hidden in the ground. This means that you will save both time and energy when you are working. It has a t-grip that will fit into your hands to make turning easier. You don't need to use a lot of effort when you are planting your ideal bulbs. The quality of the tool will also impress you because it is not cheaply made. It features a strong and durable steel construction meaning that it will serve you longer. Are you looking forward to planting bulbs during summer and need a convenient tool that will make your work easier? Look no further because the Flexrake LRB120 Adjustable Hinged Bulb Planter is designed to make your work simple. This is a high-quality tool that is made in the USA to make planting bulbs a simple and less tedious task. You can plant bulbs without taking too much time as compared to using a shovel or other tools. It is designed with a hinged soil opening to make it easy to release soil. On both sides, the bulb planter has a convenient depth marker which makes planting bulbs easy. If you need a tool with a superb construction, then you will love this one. It is made of chrome plated steel that makes it one of the most durable tools out there. The poly handle of the tool is also designed to give you a good grip and maximum comfort when you are planting your bulbs. You can plant bulbs without straining your back or neck. This bulb planter is not only good for planting bulbs. You can also use it to plant flowers. It digs deep enough and ensures that you get consistent holes all the time. What are some of the things that you check when buying a bulb planter? If you do not know the right criteria to use, I have given some important tips that will help you select the best. Bulb planters are not designed the same. There are some models that are easy to use while others are a little complicated. Because you want to make your work easy, I would recommend you to look for a model that is easy to use. The tool should do the work it is designed for and if it cannot meet your needs, then there is no need of buying it. If you get a bulb planter that is easy to use, it will be safer and less stressful when you are using it. When you are purchasing any tool, one of the most important considerations that you should think of is the durability. Why should you spend money on a product that will not last longer? If you select a durable product and use it the right way, then you can be sure of having a great performance for many years. Make sure you select a quality and durable bulb planter for a longer performance. Safety is important when you are dealing with any tool. You don't want to end up with injuries because of neglecting safety features. Not all the tools you find on the market today are made with safety in mind. This is why you should consider the safety of the tool before you buy it so that you can use it without any issues. This helps you work well without worrying about accidents. Sometimes the cost of the product goes hand in hand with the performance. If you invest your money on a cheap product, you can expect low quality. It is great if you invest your money on a high-quality product so that you can get value for your purchase. Spending your money on low-quality models means that you will have to do frequent replacements and this can be expensive in the long run. If you have planted bulbs in the past, you understand that it is a tedious task. If you do not want to spend a lot of time planting, invest in the right tools that are designed to make your work easier. Having a bulb planter will make a big difference when it comes to planting bulbs. These tools are great for people who do not want to keep their hands dirty when planting. Bulb planters are designed such that they can help you make holes even in the toughest soil. Using these tools will help you plant bulbs in less time without using much effort. We spent more time to provide you with reviews and guide of top-rated bulb planters that work well. We only recommend the best products to our customers. I believe after reading the reviews of the individual products, it will be easy for you to pick a product with the right features and meets your planting needs. Top 10 Best Tripod Sprinklers Reviews – Excellent Selections! I launched this blog as a product reviewer and passionate blogger. Beside provide advance material, guiding you towards a better home and outdoors gears essentials reviews. I devote my maximum time creating research-based product recommended to you for an easy pick. How to Look Beautiful and Attractive – Needful Tips! How to Drive a Car for the First Time – Important Idea & Tips!